We've all done it. We've all spent money on little things that don't really matter. The $5 Starbuck's coffees, the fast-food work lunches, the expensive dinners, and junk toys for the kiddos. Everyday, we end up making small, incremental spending decisions which, at the time, don't necessarily break the bank. When you add this stuff up over time, though, these small purchases can add up to some big bucks! When you sit down and really think about it, it can almost seem like you're just flushing your hard-earned dollars down the toilet! For example, if you went into the old S-bux for a $5 coffee every day, that's going to add up to $150 in a month! Or, let's say that you took your family out to a few decent restaurants, three times a week at $40-50 bucks a pop. Then, you will end up spending something like $480-600 a month. That's the equivalent of a car payment! Hope you like the food! Instead of spending these smaller amounts of money on a regular basis that, at the end of the day, don't really matter, what if you took a different approach? Hey, I like me a S-bux coffee on occasion and even a nice dinner out from time-to-time, but spending those crazy amounts of money on stuff that won't last but a few hours in my stomach, doesn't make a whole lot of sense, does it? 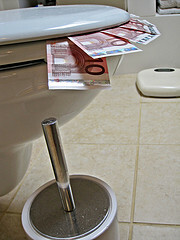 All of that money really is eventually going to be flushed down the toilet - literally! What if you came up with a better plan that saved yourself money? In order to get your coffee or food fixes, you could start by planning them out as occasional purchases, combined with at home remedies. For example, you could buy a better grade of coffee for your coffee maker, get yourself a nice travel mug, and start taking your coffee with you to work. If you absolutely can't stay away from the whole barrista experience, then you could still go to an actual coffee shop, one or two times a week, and save yourself a whole lot of money over the long haul. You need an overall spending plan, though. You need to sit down once a month and plan out how you are going to spend your money. Focus on the big stuff first, such as giving back to the Lord, saving some of your money, reoccurring bills, and paying down any debt. After you have the big stuff taken care of in your spending, then build in some "fun money" so that you can go out and get an occasional coffee or nice dinner. The key with having a spending plan is prioritizing the stuff that really matters to you and your family. Can you honestly say that the coffee's and the dinners out are a family priority? Sure, the time spent together doing these entertainment-type activities is a high priority, but you could be more creative in getting that family time without the financial expense. I think the spending of large amounts of money in this area is more of a lazy factor. It's easier for us, it's more convenient to just spend the extra cash to get whatever needs met. It takes a little more energy and advanced planning to get those needs met without spending a pile of money. Don't focus on the time, energy, and creativity it will take to have a spending plan with money-saving alternatives. Focus on the end-goals. What are you truly desiring your plan to achieve? Do you need more money in the bank for your emergency fund, more money to throw at your debt snowball, or more money for your kid's college savings? Get your cash flow plan focused on these big areas, first, but still allow for some of these smaller expenses to happen as a part of your "blow money" or entertainment-type spending. What are the financial "big things" that really matter in your life and the life of your family? Are you focused on these big things, or are you allowing your finances to be consumed by the little things that don't really matter? What do you and your family need to do refocus and re-prioritize on the most important things?